I've tried several times now to de-clutter our refrigerator. You'd think I'd be delighted to get back to our U.S. sized double wide fridge after barely managing with skinny French frigos for several years. I appreciate the space of the U.S. version, but I find that more space means I don't have to be so strategic about how I organize or purchase the food, and it's really easy to over-buy. I have to be honest; in our U.S. home we have two refrigerators, an old one in the basement for drinks, plus a standing freezer. Sometimes we can't possibly eat all the food in storage before it spoils and this is precisely one point made in an article about the growing popularity of refrigeration in China. Experts note that despite the advantages of refrigeration for food storage (to prevent waste), too much refrigeration can also lead to waste, at a later point in time. (See Twilley, Nicola. 2014 (July 25). "What do Chinese Dumplings have to do with Global Warming" NY Times magazine online.) 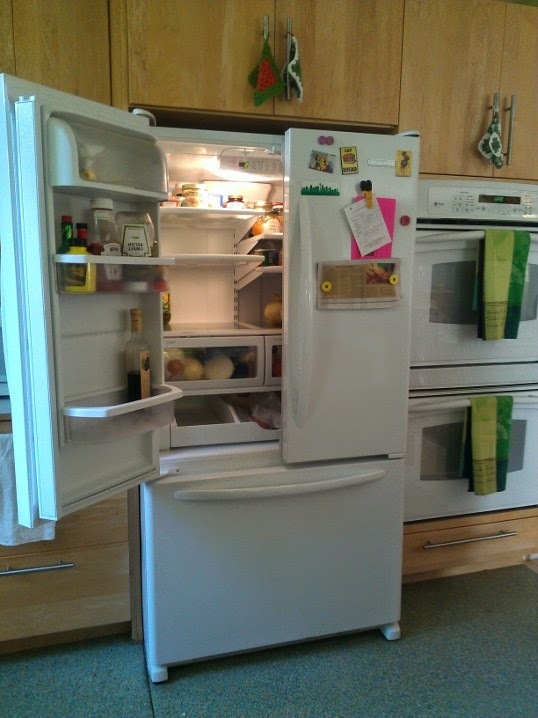 The tendency to keep shiny big refrigerators well-stocked often means those same refrigerators serve as nice cold trashcans when the overstock isn't consumed fast enough or gets lost behind other more newly purchased food. Anyone that has been to Costco knows these problems--how to consume the contents of the large boxes of lettuce or giant tubs of sour cream before they spoil or where to find that special condiment behind the big bottles of other ones. The waste problem applies to other overly-abundant consumer goods too. James Collins writes amusingly about his discovery that the box(es) of replacement staples for his paper stapler and his other office supplies will outlast him: (2014 March "Let Me Count the Days" NY Times Opinionator.) He calculates that he uses about 15 staples a year, which means his box of 5000 staples is really overkill. That box of staples is going to be something his descendants will have to deal with, and I'm afraid I have the same staple supply problem, even after parsing our belongings twice in 4 years to accommodate a move to Europe and back again. Then there are the extra spaces that some of our homes come with which also create opportunities for waste: the garage, which everyone in the U.S. knows isn't really for our car but for storing all our STUFF, and the attic. In France, we were lucky enough to rent a dedicated garage 'box' as they called it, but it was so small that we could barely get our car to fit into it, let alone any stuff, and it was a block from our home. So not much storage there or opportunities for waste, but we did have ample space in our apt. for bikes that were hardly ridden and toolboxes and countless supplies bought at the hardware store. As for our attic here in the U.S. house, we packed it with all of our belongings that we didn't take with us to France, and....it still contains a large portion of our belongings that we didn't take with us to France. I think we could easily empty the attic and not even realize what we are missing. Having abundance, of goods and spaces, is a privilege for sure and having access to refrigeration is too. I wish everyone would have such privileges, and I appreciate how these can contribute to lowering some of the costs of living. But, there is something to be said for that mindful shopping, that careful planning, that is required when we are dealing with less space, fewer means, and fewer options.